Additional Info: Aloe Vera is originally found in eastern and southern parts of Africa. The plant is artificially grown in warm countries and West Indies. Aloe leaves are characterized by a special gel-like substance, which is used to produce aloe vera gel. This plant is considered to be the very oil used to anoint Jesus Christ after His death. Elements Applied: The commonly used elements are leaf juice and leaf gel. The root is also used as a potent remedy. Active Components: Leaf gel contains aloin, a substance which is linked with the herb’s treating abilities. Used for: The plant is widely used due to its curing capacity and is known to boost metabolic rates, act as a tonic, produce a laxative effect, regulate menstruations and soothe pains. When applied externally, aloe vera restores skin tissues and may aid the healing of burns and sores. It may be as well applied on blemishes and dandruff. Used cosmetically, Aloe vera softens the skin. Plant’s exctract is used externally to make one’s skin soft and smooth. It’s not only potent of enhancing its condition, but also of curing different types of sores and blisters, burns and defects. 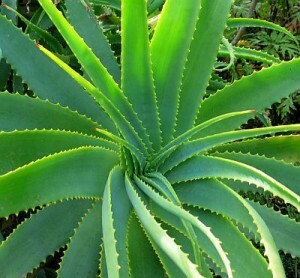 As an oral remedy aloe vera is applied for digestive system diseases and abnormalities. Dried aloe leaves have ability to produce a strong purgative effect. Aloe vera has a wide range of application cases from sunburn, x-ray burns, first degree burns, chemical burns, bedsores, various skin inflammations, herpes virus, peridontal surgical operations, stomach ulcers, insect bites, plant irritations and other skin problems of inconsiderable value. When rinsing your mouth with aloe remedy, you have a possibility to cure lockjaw and cold spores. Aloe has been referred to as an effective medicine for swelling or facial edema. The range of conditions aloe vera is used for, includes: venereal diseases, vaginitis, ulcers, tumors, respiratory system disorders, toothache, enlarged spleen, sore throat, sores, skin rashes and inflammations, rheumatism, menopausal symptoms and amenorrhea, enlarged liver, kidney dysfunction, jaundice, helminthes, insomnia, infant pneumonia, herpes, hepatitis, hemorrhoids, heart pain, gonorrhea, fever, sugar and fat metabolism, vision and eye problems (including conjuctivitis), ear infections, dysentery, dysmenorrhea, coughs, bursitis, constipation, colic, burns, colds, asthma, diseased or lumpy breasts. Preparation and intake: Aloe vera is produced in different forms: lotion or salve, natural gel, powder in tablets or capsules, liquid remedies, or freshly prepared. Oral and external application is practised depending on the kind of the disease. For inconsiderable inflamed areas and minor damages aloe gel is applied straight onto the area of inflammation. If a considerable area is affected, a special lotion is used. If applied internally, aloe vera is produced in form of a concentrated remedy which should be diluted in 1 quart of liquid per 1 ounce of medicine. Safety: Aloe gel is considered safe to consume across the United States. In Canada the remedy is sold without prescription as a purgative. French doctors refer it to conventional medicine. In Germany the medicine is also sold without prescription. In case of pregnancy, monthlies, or stomach and spleen disorder aloe vera should be avoided.